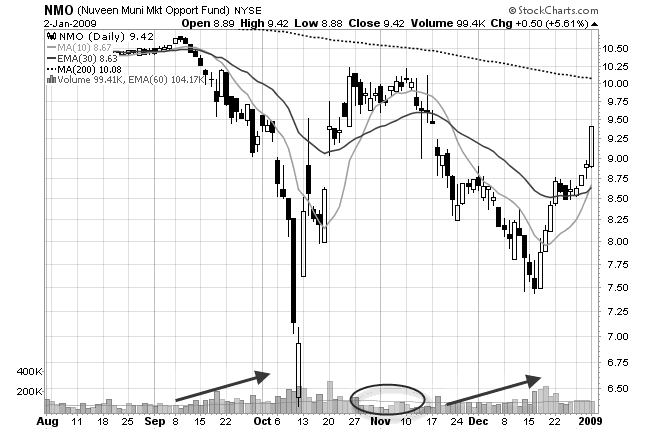 Stock chart volume is probably the most misunderstood of all technical indicators used by swing traders. 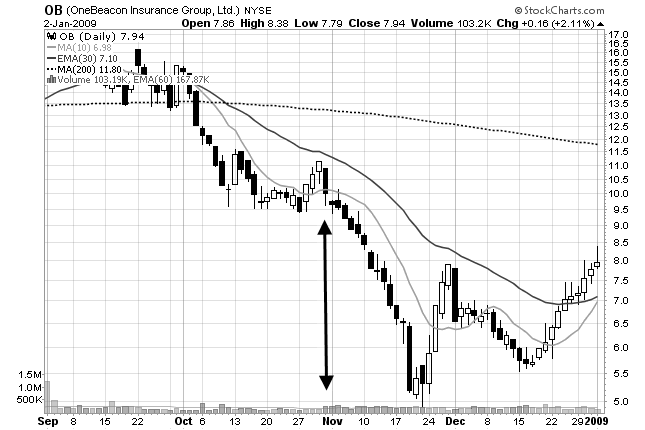 Here, on the left side of the chart, this stock begins to fall. Volume increases dramatically (first green arrow) as more and more traders get nervous about the rapid decline of this stock. Eventually everyone piles in and the selling pressure ends. A reversal takes place. Then, in the middle of the chart, volume begins to taper off (red circle) as traders begin to lose interest in this stock. There are no more buyers to push the stock higher. A reversal takes place. Then, on the right side of the chart, volume begins to increase again (second green arrow) and another reversal takes place. Mistakenly, some traders think that stocks that stocks that are “up on high volume” means that there were more buyers than sellers, or stocks that are “down on high volume” means that there are more sellers than buyers. Wrong! Regardless if it is a high volume day or a low volume day there is still a buyer for every seller. You can’t buy something unless someone is selling it to you and you can’t sell something unless someone is buying it from you!